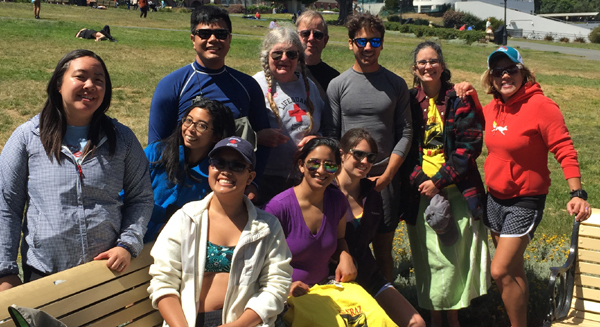 De Anza College graduates volunteered again in 2017 at the Escape from Alcatraz Sharkfest swim, and a swim student made her first try at the race. I just wanted to let you know I’ve been actively swimming and training for Sunday’s Sharkfest. 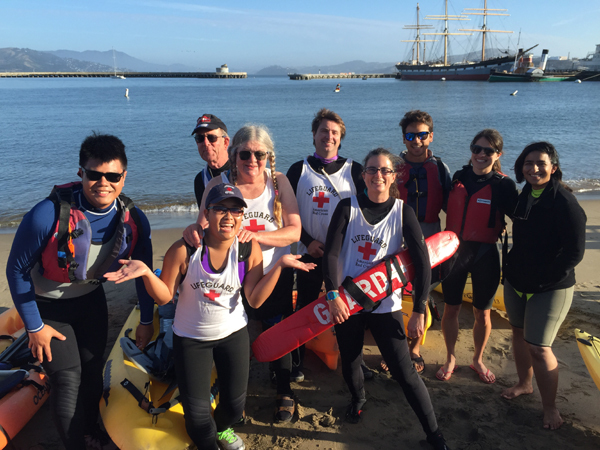 I ended up joining the South End Rowing Club and have been swimming in Aquatic Park since April – no wetsuit! I really love open water swimming because there are no walls, but I also love pool swimming to work on drills and I can see. 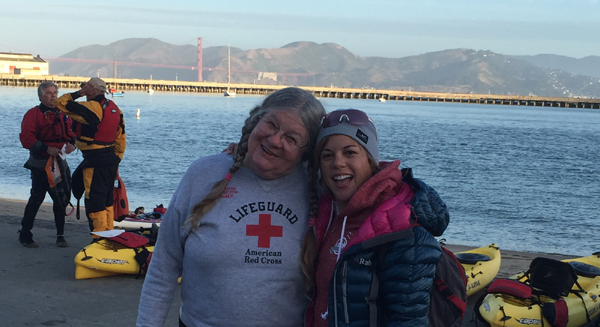 . .
Christine’s time in this, her first Alcatraz swim, was 01:05:08.7. Many swimmers took 39-42 minutes. The fastest swimmer in the non-wetsuit category (yes, in 58-62° F temperature water, wearing no wetsuit, like Christine) was a 19 year old male at: 30:24.7.and a 15 year old female at 32.11. In the wearing a wetsuit category an 18 year old male had a time of 29:15.2 and a 37 year old female at 31.03. Some of the people in their sixties beat people in their teens. A few in their seventies beat people in their twenties. It is named the Sharkfest, but we have never seen any sharks. Occasionally we see a few seals swimming and diving at the outside edge of the swimmers. 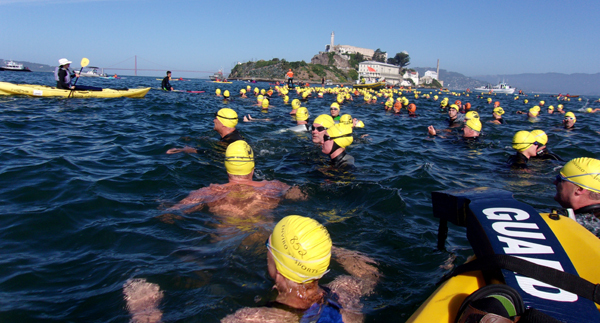 During the swim, the shipping channel between Alcatraz and S.F. is closed to shipping. The start line is formed by kayakers and is not quite straight. In this next photo you can see the boat with big red buoys the swimmers will follow to near the entrance to Aquatic park where their finish is. Moments after the start, can you spot the lead boat with giant red buoys for the swimmers to follow? If a swimmer indicates they need help, a kayaker goes to them, or sometime a lifeguard notices a distressed swimmer and approaches them and talks to them. They are given encouragement, but if they need medical or other help (this year including hypothermia, an allergic reaction, severe cramps and one young man who was just a bit too overwhelmed) they sometimes get a swift ride to the finish (where an ambulance and large paramedic team is waiting) on the back of a water craft with a San Francisco Police Department rescue swimmer/officer (she is lying down on the sled at the back and you can see her yellow swim cap). At the finish in Aquatic Park, the last few swimmers, after an hour in San Francisco bay, are accompanied by about ten kayakers per swimmer. The swimmers run up on the beach to a pad on the ground that records their time from a timing chip velcroed around their ankle during the swim. 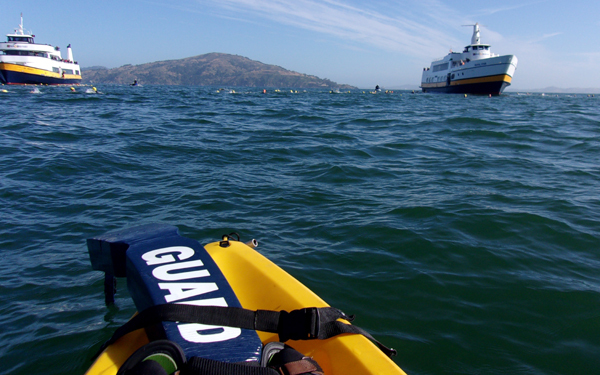 The race is set to start when the current is bringing people to San Francisco. 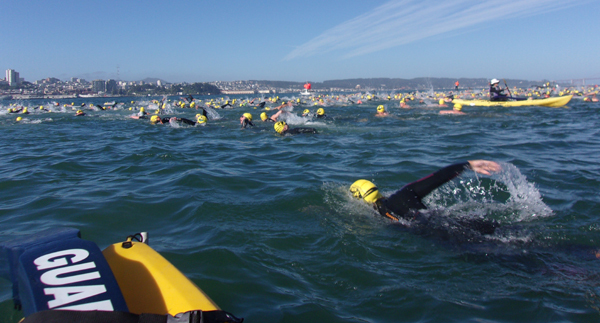 Near the end of the swim time (usual cutoff of 75 minutes) the current changes and the athletes can’t swim fast enough to get to the finish, so some are given a lift on a Zodiac or boat to the entrance to Aquatic Park where they can complete the swim. In this 2017 race, everyone finished in time before the current changed! People from all over the U.S. and many other countries swim this race. In 2017 the list of cities people came from included almost every city/town in California as well as London, Perth, Sydney, North Vancouver, Calgary, Winnipeg, Venice, Holland, Quebec City, Batavia, Val-d Or, St Louis, Fort Worth, Boston, Tacoma, Tempe, Fort Collins, Phoenix, Woodstock, Denver, Mesa, New York, Salt Lake City, Huston, Scottsdale, Albuquerque, Bend, Las Vegas, Nashville, Raleigh, New Orleans, Kalamazoo, Seattle, Lake Waukomis, Naperville, Boulder, Philadelphia, Baltimore, Annapolis, Cedar City and Colorado Springs. If you are a non-swimmer, consider taking novice swimming at De Anza College. 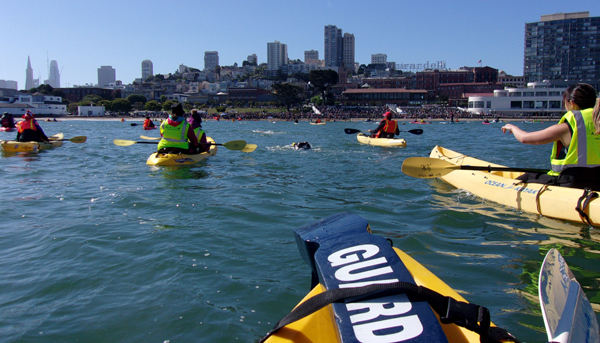 Kayaking experience is needed to volunteer at the race, such as the De Anza Outdoor Club October or spring break/spring quarter Monterey trip. 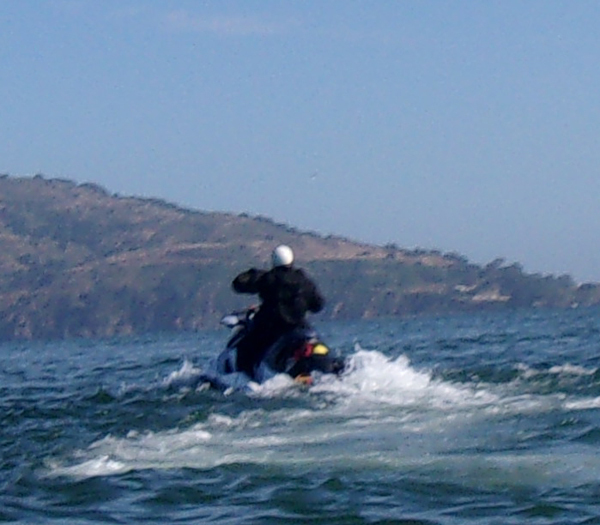 For the date and price of the next De Anza College Outdoor Club kayak day trip go to: Outdoor Club Coming Attractions and read details at: Monterey ocean kayak day trip. You do not need first aid training to volunteer, but many of the volunteers are trained and you can get a Red Cross first aid certification class at De Anza College, with a free download of the textbook: HLTH 57A.